The co-worker who has been craving grinders has rubbed off on me. Mancino’s is on the other side of town though and I wanted to pick something up before I went to work. Last night, I got one of those Good Deals magazines in the mail filled with coupons. One of those coupons was for Angelo’s Italian Eatery. 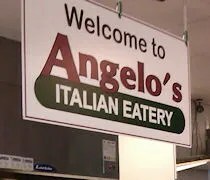 Angelo’s has two locations in the Kalamazoo area. One is near the airport on Portage Road. 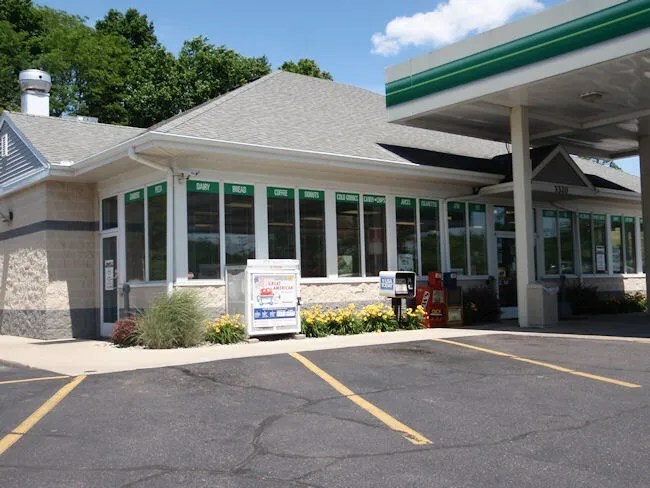 The other is inside the BP station on the corner of Ravine and Nichols in Kalamazoo Township. It wouldn’t make a whole lot of sense for me to drive all the way to Portage when I could sort of make the Ravine Road location on my way to work. The restaurant takes up a very small space inside the gas station. I wasn’t 100% sure at first if it was even still there. There is minimal signage on the outside. I noticed later that the door on the west side of the building has the Angelo’s logo, but that’s the only marking on the outside. 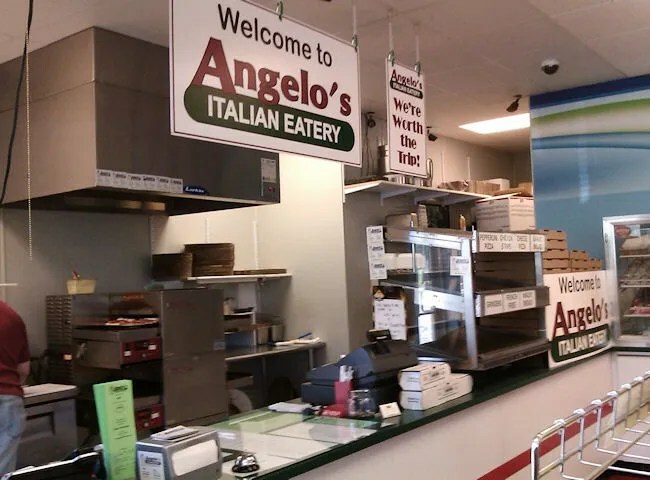 Inside, you have to make your way through the somewhat cramped gas station to get to the Angelo’s kitchen. There are paper menus available at the counter and there is also one taped down next to the cash register. I had already looked at the menu before I got there and knew I wanted the 16″ Pizza Grinder. I decided to stick to what I know. The lone man working both the register and he kitchen and asked for my name. After settling the $11 bill, he told me it would be about five minutes. I sat down at the lone table next to the order counter after I bought a bottle of Pepsi from the gas station. Before I could even check in on Foursquare, I heard my name being called. I was handed a large box with my sandwich and I was on my way to work. The sandwich was exactly what I was craving. It was on soft, yet crunchy white bread that was perfectly toasted in the conveyor oven. It was filled with a generous portion of mozzarella cheese, marinara, and pepperoni’s. The thing that surprised me is that the sandwich was so much thicker than the typical sandwich from the competition. I’ve always been a fan of Mancino’s, but I really think Angelo’s makes a better sandwich. 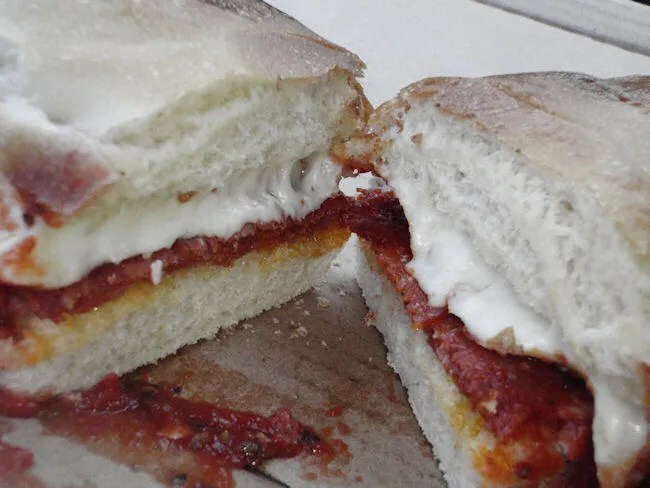 I was able to get two meals out of my 16″ sandwich and I only spilled a little bit of the marinara sauce on my shirt while I was trying to eat it while driving. I’m pretty sure I just found my new grinder place. It’s always going to be out of the way for me, but next time I’m craving a grinder, I’ll know where to go. Their Italian Deluxe sandwich is also very, very good.